The Stage to Scale Speaker Training by Pete Vargas sounds like a good deal, but is it really? Make sure you read this first because it will help you decide whether this course is a wise move for your business. Full review and nearly $1000 in bonuses below. This post contains my alumni affiliate link. To read my full disclosure, click here. What’s all the fuss about Pete Vargas’ new course, Stage to Scale Speaker Training? It is my goal in this post to calm your nerves and give you the information you need to make a wise decision. Before we go any further though, I have to give you a full disclaimer: I have been through Pete's course and I am an affiliate for it. I consider Pete a friend. Just to clarify, though, that does not affect what I share below in any way. It does mean that if you purchase the course through my affiliate link, I’ll get a small commission (just like I do when you purchase my books on Amazon). It also means that if you purchase through my links in this review, you will earn access to my two exclusive bonuses, worth nearly $1000. These bonuses are not available anywhere else. Ok, so now, necessary disclaimers aside, let's move on to the the good stuff! … Here’s my full review of Stage to Scale Speaker Training with Pete Vargas. You can either watch the video or read the review below. What's So Awesome About Stage to Scale? Some people call Pete Vargas the “stage whisperer.” I call him the “stage genius.” Why? Because he’s booked over 25,000 stages over the past 15 years, and as a result he has generated tens-of-millions of dollars in revenue! His client list is full of stars like Stu McLaren, Lewis Howes, Pat Flynn and many more who are leveraging stages to grow their businesses. I have taken his course and am using it successfully to redefine and grow my own business! If I wasn’t convinced his model would work for me, and for you, and for anyone in any niche, I wouldn’t be writing this review! 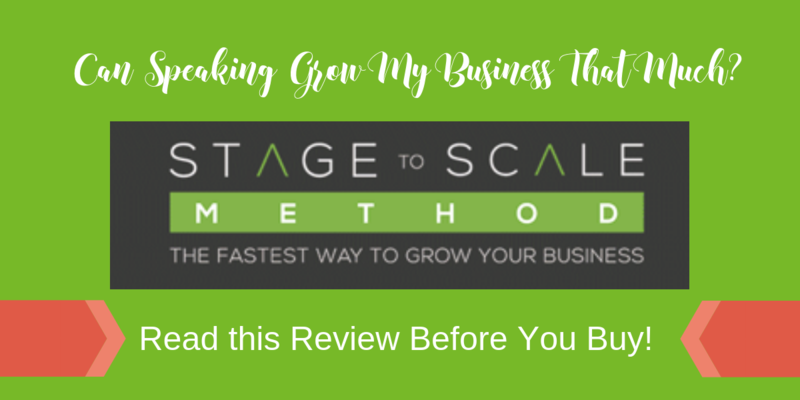 Stage to Scale Speaker Training is his comprehensive system for getting on the best stages, crafting your Signature Talk, and accelerating your business growth from virtually every kind of stage you can imagine. There are not many courses out there that are this well done, this comprehensive AND also include live coaching! For 8 weeks, you will meet weekly with Pete Vargas, Pat Quinn, an award winning speaker coach, and the other members of your class to get personalized help in applying what they're teaching. Community. You will have access to the Stage to Scale Community, where you can ask questions, get feedback and support other course owners — and, of course, Pete and his team will pop in there as well! Live Coaching every. single. week for 8 weeks! So you can get your questions answers as you are working through the course by Pete or a real member of his team! BONUS Vault. I don’t know about you, but when I hear “vault” I get the impression that they’ve spent a lot of time compiling a treasure trove of resources. And they have! I loved the Facebook community in the Stage to Scale Speaker Training It was amazing how the other students would rally around to encourage and support each other. Who Should Take the Stage to Scale Course? Professional speakers who already speak for a living but may go from one stage to the next… without SCALING, or having a process of retaining the new clients they gain from a speaking gig. However, it might also include anyone who wants to start a business or jump start it via speaking. And while it's helpful to have some sort of online presence (blog or website), Pete's had people successfully grow a speaking business without it, so I know it can be done. …anyone else wanting to grow their business by speaking. Regardless of your niche or area of expertise, if you're looking for a way to stabilize and grow your business by speaking on other people's stages and securing work with the audience after the stage, then Stage to Scale is probably for you! My personal goal of helping 20,000 people over the next 10 years create transformational courses to grow their messages into movements was inspired in part by this class, and definitely empowered by this class. We're already filling our speaking calendar for next year! Who is Stage to Scale NOT For? You are already a pro at speaking and converting the audience into customers. You’re not willing to see the cost as an investment (as of this writing, Stage to Scale costs $1,997). You think this is a “get rich quick” plan that will magically cause money to appear in your bank account. You don’t want to speak on stages or grow your business by adding speaking to your model. If you aren’t teachable or willing to apply yourself to learn from Pete and Pat and put the work in to develop your own signature talk, scaling offer and follow up, then I would strongly advise you NOT to purchase Pete's course. WHAT IS IN PETE VARGAS' STAGE TO SCALE COURSE? Lifetime access to 50 video lessons (available online 24/7). If you prefer reading, they have fully transcribed each lesson for you. Each lesson comes with audio, so you can download and listen on the go. They're continuously adding material to the program, and you get those updates for free. Plus for anyone who joins Stage to Scale Speaker Training through my link, you'll be eligible for 2 months free access to our Blog Well Mastermind! A weekly meeting of serious women entrepreneurs that will help you stay on track to follow through with the course and really grow your business! $1,997 or 6 payments of $397. Enrollment for Stage to Scale is closing at 11:59 pm on Nov. 2nd. This is indeed a “hard deadline” because the live coaching will start the week of November 5th! Reach Live is Pete’s 3-day live event where you’ll go deeper into the Stage to Scale Method. You’ll meet world-renowned speakers, coaches, influencers, and get to meet the entire Advance Your Reach Team! How long will I need to dedicate to keep up with the work each week to get the most out of the coaching sessions? There are over 50 video lessons and the beautiful thing is that each video is fully transcribed so you can read along or simply read the content or see it in context to what you’re learning on screen. As some people can read faster than a video so this is an option but on average you have 3-4 hours of review and do each week. They also provide audio only version for each lesson which you can download and listen to on the go. And there are optional use step-by-step worksheets to help you implement. I didn't end up needing to print most of them, but they're there and helpful for some. To be honest, it's just about 0% risk. Here's why… If you take a look at Pete's track record – winning over 25,000 stages and helping Lewis Howes, Pat Flynn and many more, there is really no question as to his ability to build a successful business model around speaking that is both profitable and sustainable. Really, the only variable is whether you are going to be teachable and put in the necessary work! But, still the same, Pete offers a 30-Day Money Back Guarantee. All he asks is that you send him your work, showing that you have gone through the exercises included in the course…and if you still didn’t get the results you were hoping for, Pete will happily refund your money. So now that you’ve read to this point, you know enough to make a wise decision. Is this for you? or not? 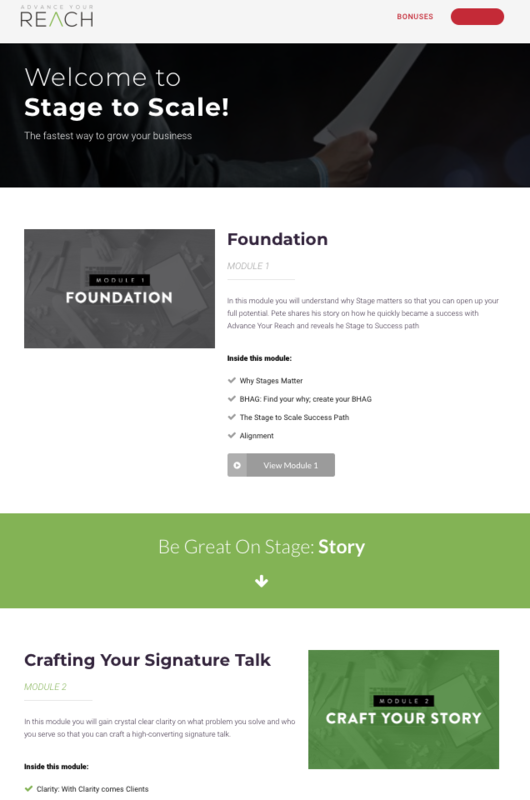 Click the button below to purchase the Stage to Scale speaker training by Pete Vargas and get ready to create reliable, recurring income in your business by leveraging other people's stages and scaling your offer beyond the stage! Excellent review of this opportunity. I am in!